Sandvik Process Systems is a world-leading supplier of steel belts and processing systems to the food industry. 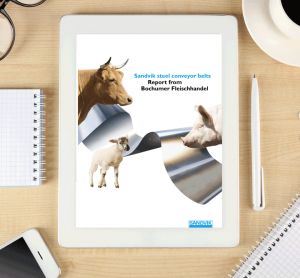 Sandvik steel belts have been used for food processing for almost 100 years, with applications ranging from simple conveying to continuous processes such as cooling/solidification, drying/dehydration, conditioning, casting, freezing, baking and finishing. The company supplies belts in carbon or stainless steel to suit different applications. They can be manufactured in solid form, or perforated to provide a longer-lasting, lighter alternative to wire mesh belts. One of the key advantages of processing on a steel belt is the assurance of maximum hygiene; the strength, flatness and durability of a solid steel belt enables easy and effective cleaning and sanitising. This means that Sandvik stainless steel belts are often used for GMP (Good Manufacturing Practice) compliant processing. Bake ovens belts represent the largest food-related market for the company, and can be produced in widths from 800 – 3500 mm. The use of wide belts enables increased productivity in existing facilities, without having to invest in expensive extensions. The thermal properties of a steel belt make it ideal for an application where temperatures can reach as high as 400ºC. The belt remains stable, provides excellent thermal conductivity for good baking performance and consistent product quality, and delivers clean product release, ensuring that high product quality standards are maintained. While initial investment costs might be higher for a solid or perforated steel belt, overall return on investment can be very attractive. Being significantly lighter than other conveying materials, less energy is needed to ‘drive’ the belt through the oven. Their relative lightness compared with mesh belts also means they cost less to heat – as much as 30% less in the case of perforated belts – and this can result in significant savings given that belt heating will typically account for around 25% of a bake oven’s total requirement. While steel belts are the company’s core product, Sandvik also supplies a complete range of conveyor systems and accessories. Engineers can advise on upgrade paths or optimum process layouts, and the company’s worldwide technical support network means that installations and commissioning can be carried out quickly and efficiently. The company has recently announced the development of a compact ‘Clean Conveyor’ unit that represents best practice in terms of hygienic food conveying. The new conveyor unit features a stainless steel framework designed to allow access for cleaning, with no narrow gaps or other hard-to-reach places in which dirt, debris and bacteria could otherwise collect. The framework is also designed to minimize the risk of water pooling after cleaning, reducing the possibility of bacterial growth. The stainless steel conveyor belt is ‘endless welded’ to eliminate any trace of a joint and its smooth surface means there are no hidden gaps or recesses in which bacteria could collect. All bearings are food approved and lubricated for life with food-approved lubricating grease. The motor is food-approved and has IP65 protection. The company’s steel belts provide a flat, smooth, hard and inert conveying medium that can be cleaned and sanitised using heat, pressure, brushes, detergents or chemicals. 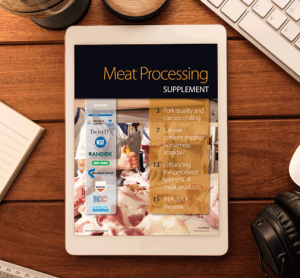 This makes them ideally suited to hygiene critical applications such as meat conveying. Quick and easy cleaning enables high standards of hygiene to be maintained. 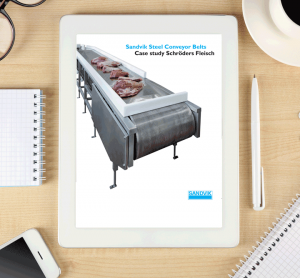 Research by Finnish food laboratory VTT Expert Services Ltd has confirmed the superior cleanability of stainless steel compared with other conveyor materials, enabling easier and more effective protection against the risk of bacterial build-up on meat conveyors. This inherent ease of cleaning offers a number of other benefits too. Low water consumption and reduced use of cleaning chemicals or detergents means cost savings of up to 30% and less impact on the environment, while faster cleaning results in less downtime. As well as supplying steel belts and conveyors to OEMs, Sandvik also produces it own process systems and is a leading supplier of forming/solidification equipment. 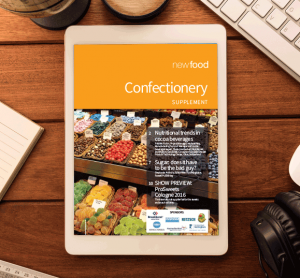 These ranges include the Rotoform FD, a system that combines a drop depositor and stainless steel cooling belt to solidify food products such as fats, chocolate and jelly into pastilles. The Rotoform process is simple and efficient. The molten product is fed into the Rotoform unit (a heated stator and perforated cylinder that rotates around the stator), depositing the melt onto the belt in the form of drops. The belt runs at a speed synchronised to that of the depositor, ensuring that the hemispherical drops are of a consistent size and shape. The heat of the melt is transferred to cooling air blown onto the product and also to the belt itself. (Another method – suitable for products not sensitive to humidity – is to spray cooling water onto the underside of the belt.) The excellent thermal conductivity of the belt delivers fast, controlled solidification and the pastilles are discharged cleanly at the end of the system. The rotating design of the Rotoform unit allows continuous and consistent dosing of the product onto the steel belt, while the specially designed outer shell maximises use of the available belt width. The system can be adjusted to ensure consistent dosing if there’s a need to process products of different viscosities, and pastille size can be changed by replacing the outer shell and metering bar, a job that takes no more than 10-15 minutes. 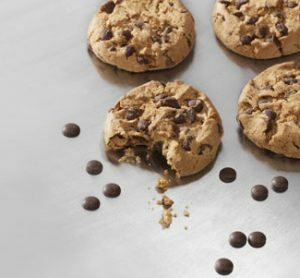 Group company Sandvik SGL Technology specialises in moulding machines for the efficient production of industrial chocolate chunks, bars and chips/drops, and a wide range of decorative chocolate products including blossoms, pencils, sticks/rolls and more. 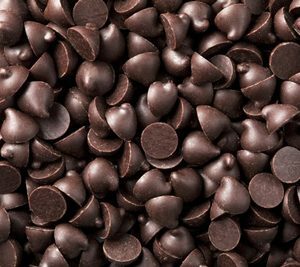 The Sandvik SGL Technology MCC 1500 is a multi-layer chocolate chips/drops moulding line offering up to three times the capacity of other systems of the same length. This is achieved by ‘stacking’ three depositors one above the other, with each feeding a separate cooling / solidification line within one overall unit. Combining three production lines in one delivers a forming capacity of between 4-6 tonnes per hour – depending on chip size. It also allows the production of different recipes or product shapes sizes at the same time. This high capacity, multi-layer line allows producers to achieve up to the three times the throughput from the same footprint, and so meet growing market demand without having to invest in new build facilities or factory extensions.